If you could pick one word that sums up the whole moving home experience, you would probably be using an expletive. Wouldn’t it be nice to actually experience one of these milestones without losing any hair or falling out with your nearest and dearest? There is no doubt that moving your possessions whilst worrying about your new mortgage repayments is never going to be easy, but does it have to be quite so hard? So with all of these less than pleasant thoughts floating about, how about some good news instead? There are a couple of very capable Smartphone Apps that are more than happy to take some of that strain of your shoulders during your next home move. We’ve got 2 of the best right here and have added an unbiased review for each of these bad boys – relax and enjoy! This App will run on your iPhone, iPod Touch and iPad and it requires iOS 6.0 or later for smooth running. 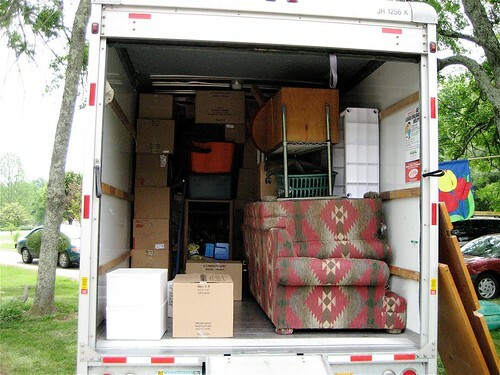 Okay, what do you need in order to make your home move nice and smooth? Well, an extremely cool planner will probably be top of your list, that and a great big truck! Home Move Pro offers the complete planner and checklist to the home mover for a stress free experience. You’ve got a plethora of templates that will help you to make a checklist for absolutely every aspect of the move, and you can even add audio notes for those special items. Take photos of the wall decorations, and there will be no arguing over the correct angles for rehanging the paintings and so on. Once you have everything organised with Home Move Pro, the actual event will go like clockwork, or at least that is the plan! We thoroughly recommend this App for first time movers and veterans alike! This App will run on your iPhone, iPod Touch and iPad and it requires iOS 3.0 or later for smooth running. Well, our second home moving help App is a real find, and is also totally free. You’ll get a whole bunch of checklists that have been designed for home movers and they can all be tweaked to suit your own possessions. If you’ve heard about a particular haulage/moving company and need to learn a little more, check out the review section at your leisure. If you’ve had a good or bad experience with a moving company, add your own thoughts via this App. You even have a distance calculator to get the exact mileage between your new and old home, just in case the moving company try to add a few extra miles! This App is extremely easy on the eye and is also available on Android and Blackberry platforms. We think it may just have the edge over similar Apps out there right now, so get it quick! Either of these Apps will take a lot of stress out of your next move, but just remember to grab them whilst they’re still free! Amy Rand, the author of this article, works for, Abacus Self Storage, leading providers of storage facilities and rental storage units. She is an avid pianist and plays for charity events in the city. Ever since SLee went to Japan, he’s wanted to add a Japanese keyboard to every device he gets his hands on. So when he got his Samsung Galaxy S III, I knew it wouldn’t be long before he asked me how to put Japanese on it as well. The good news is, it’s a relatively simple process that works for Japanese as well as dozens of other languages. Why haven’t you received the Android 4.1 Jelly Bean Update yet? If you have the Samsung Galaxy S3 with Sprint, you should be able to get it in just a few simple steps. With both Halo 4 and Call of Duty: Black Ops II coming out earlier this month, I haven’t made a lot of time for playing with my new Samsung Galaxy S3. But over the Thanksgiving holiday I was out of the house (and away from my Xbox), so I had more time to try and figure out why I hadn’t received the Android 4.1 Jelly Bean Update yet. Like me, you’ve probably read that Sprint began rolling out the Android 4.1 Jelly Bean update to Samsung Galaxy S3 owners at the end of October. I picked mine up at the beginning of November, so I thought I would get the update soon. I waited for a couple weeks and still hadn’t received it, even though several of my friends on Sprint told me that they already had. I stumbled on a Samsung support page and the representative told me that indeed the update was available, but that it had to come from Sprint — that there was nothing I could do to trigger the update. Thankfully, that was incorrect. There are a few simple steps that I took to force the Android 4.1 Jelly Bean update on my Sprint Samsung Galaxy S3, and you can too. Follow these 5 steps, and you should be running Jelly Bean in no time. Open the “Application manager” from the settings menu. Tap on “Google Services Framework” (you will find this alphabetically under the “All” section). Go back to the main Settings menu and click “System Update” near the bottom. Tap on “Update Samsung Software.” Since we cleared the data in the last step, this screen will list the date last checked as 12/31/1969. At this point your Sprint Samsung Galaxy S3 should find the update and begin downloading it. If it does not, repeat these steps. Some have reported needing to do this two or three times before they found the update. The update is pretty big, so it will take a while to download. After it is completely downloaded, you battery will need to be charged to at least 50% (or you must be connected to a charger) to install the update. And that’s it. Enjoy your Jelly Bean. In the last decade or so, there has been an overwhelming level of consumer and business adoption of smartphone devices. Whether it is for personal use, sharing files and photos, communicating, emailing, and gaming, or for business use, also sharing files, networking, emailing, conference calling, and increasing productivity, the sheer amount of smartphone internet usage that occurs on a daily basis nowadays by the general population is astounding. But with all of this new technological activity, most smartphone users are completely unaware of the safety, privacy and cyber security issues that come along with smartphone usage. The overall assumption is that a smartphone is a phone, and it’s not like a computer or laptop that is susceptible to hacking. Well this is a news flash for anyone who things that way – smartphones can be hacked too! This infographic, Mobile Security 101, breaks down how your smartphone and the contact lists and information inside it might have already been shared with someone without you knowing it. Gaming on iPhone is something that has come on in leaps and bounds since the inception of the iPhone, and while little throwaway games like Angry Birds are still very popular, there is now a lot more out there for the ‘core gamer’ as well thanks to the likes of Assassin’s Creed – Altair’s Chronicles, Chaos Rings and Grand Theft Auto. However if you are a nerd who likes to go beyond the normal capabilities of your devices then this might not be enough for you and you might yearn to play the likes of Super Meat Boy or Super Mario on your phone. Well good the good news is that if you are willing to tinker, then there are various ways you can get a number of different games running on your device that were never meant to be there. Here we will look at how that’s possible. Apple has some kind of grudge against Adobe Flash which is apparently down to some problems with Flash’s security (I secretly wonder if perhaps the name is just too similar for Apple’s liking?) and this has been a well-known fact for some time causing frustration among many Apple fans. The problem is that there is a lot of good Flash content out there, including a large number of great games like the Original Super Meat Boy and the wonderful Yeti Sports (who remembers that??). Well worry not as there are some ways you can get around this restriction. One of these is to try and use some of the not-so-perfect Flash supporting browsers available for iPhone on the App store. The other more effective way however is to Jailbreak your phone, and then to get yourself to the Cydia store where you can download a proper SWF player. Then you can even play Super Mario World Flash or Super Smash Flash – but I recommend getting a Bluetooth keyboard for better input. And seeing as you’ve jailbroken your device, why not install an emulator for a console like the Megadrive or the SNES. Then, if you own the original cartridges, you will be allowed to legally download the ROMs for the games you want to play on your iPhone so that you can enjoy Sonic the Hedgehog, Mario, Golden Axe or whatever else takes your fancy. Then there’s the DosBox emulator (DosPad) that will enable you to actually install MsDos on your iPhone complete with whichever old .exe files you fancy running – from JazzJackrabbit to Duke Nukem 2. In fact you can even install Windows 95 and that will give you access to Minesweeper and even Chip’s Challenge.